With care and sustainable redevelopment, disregarded historical buildings can be restored as valuable community landmarks. The concept of embodied cultural energy has emerged as a means to define the tangible impact and historical relevance of a building on the surrounding community. Embodied energy refers to a building’s raw materials, while cultural energy is an attempt to quantify a building’s impact on the history and culture of a community. Communal influence does not always correlate with historic preservation; however, growth and expansion can originate from preservation. Despite rapid growth in the United States, communities still have ways to minimize impacts to historic properties. Exploring cultural embodied energy is key to encouraging preservation. Discussions of cultural embodied energy with Dr. Simi Hoque, a distinguished architectural engineer and associate professor at Drexel University, inspired my study, “Cultural Embodied Energy in Historical Buildings in the Philadelphia Region.” The study involved three main components; the first of which was conducting a basic survey to understand the community’s views on the building. The second was modeling the raw material global warming equivalent and completing a general LEED® Core and Shell Certification analysis of the building. The third and final component of the study was analyzing the results to determine the value – financially and sustainably – of preserving the building. A considered candidate for the study would be a building that is recognizable in Philadelphia’s history. For example, the Inquirer Building – the former home of the Philadelphia Inquirer - would be ideal if there were not current plans for it. This building has a unique shape and iconic clock tower. Most Philadelphians would likely say it has cultural energy as it is an iconic building with that has made an impact. There are many ways to measure a building’s impacts on a community. The most common method is observing the change in property value. However, this can be inaccurate, since surrounding and adjacent properties influence value. Another method is collecting poverty data on the community, a measure that would quantify how well economically an area is performing. A third option, specifically for a sustainable project, is identifying the global warming impacts of the building. The best route combines analysis of: community opinions, property values, poverty levels, and global warming equivalent levels. This approach mimics the Triple Bottom Line, a performance concept which guides LEED projects and measures community, economic, and environmental benefits. This Triple Bottom Line-influenced analysis would work perfectly to study the recent restoration of the Divine Lorraine Hotel. Originally designed as an apartment complex in the late 1800s, the Divine Lorraine had fallen into a state of disrepair. In 2016, the historic building was revitalized. Similar to the former Inquirer Building, Philadelphians would likely appreciate the cultural significance of the Divine Lorraine. The red sign is memorable, and the building is well-known as a North Philadelphia landmark representing luxury and character through details in the facade and interior decorations. The building’s history and cultural embodied energy was revealed with the re-opening of the hotel as a luxury apartment building that matched the original character. When it came to my study, I focused on the Robinson Department Building, located at 1020 Market Street in Philadelphia. The building was originally a department store that was designed in 1946. Its mid-century design came the mind of architect Victor Gruen, and has been written about by websites like PlanPhilly and Hidden City Philadelphia. When conducting the first part of my study, I determined that the Robinson Department Building was unfamiliar and insignificant to the community. More than 70% of those surveyed gave it the lowest ranking possible in terms of cultural significance. Interestingly, the idea of protecting and renovating the building was overwhelmingly popular with these same people, despite having little familiarity with it. Graphical representation of the two routes a building can take in the study. The renovation of this building has a substantially smaller environmental impact, but with a higher price tag (all numbers are estimates). Modeling and preliminary LEED analysis of renovations for the second component of my study showed substantial reductions of the impact to the environment, with a slight increase in initial costs. The figure above represents the two different routes in which a building could progress, demolition or renovation. At a lower global warming potential and slightly higher increased price, preserving the building through sustainable practices would be possible. At the conclusion of my study, I determined the Robinson Department Building was not an ideal candidate for renovation based on its cultural embodied energy. It was not commonly known, and despite having a lower CO2 impact, the cost of renovation was higher than destroying and rebuilding it. A better candidate would be a building that is more recognizable in Philadelphia’s history like the Inquirer Building or the Divine Lorraine, which would rank much higher on a survey of their cultural significance. 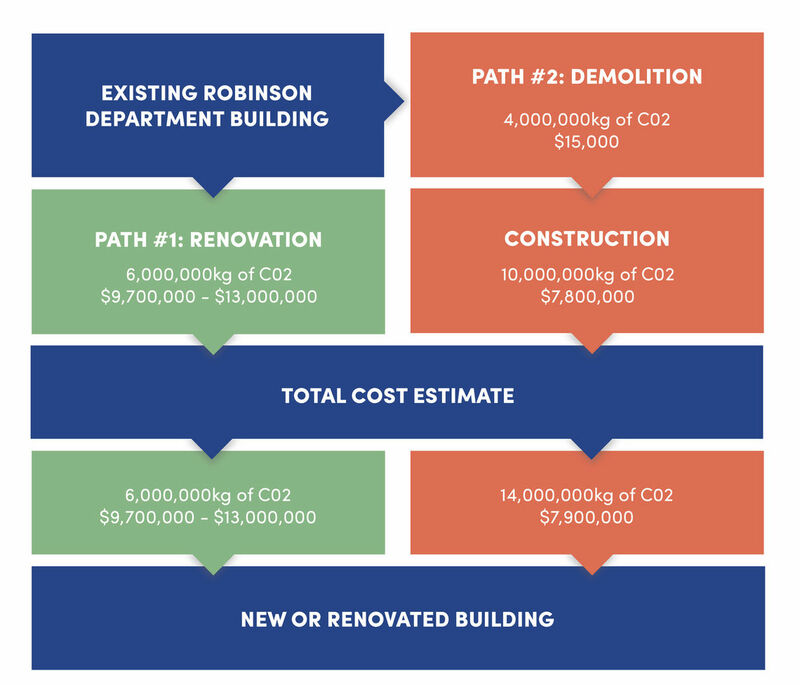 A developer renovating the Robinson Department Building would need to be in support of the lower environmental impact the renovation would have on the building to be accepting of the slightly higher cost. Successful neighborhoods include buildings which link the past, present, and future. Quantifying cultural embodied energy can help convince the community, city planners, and developers that preserving older buildings is a way to preserve neighborhood history. The concept can also be applied to new buildings by designing features that reference history and culture. 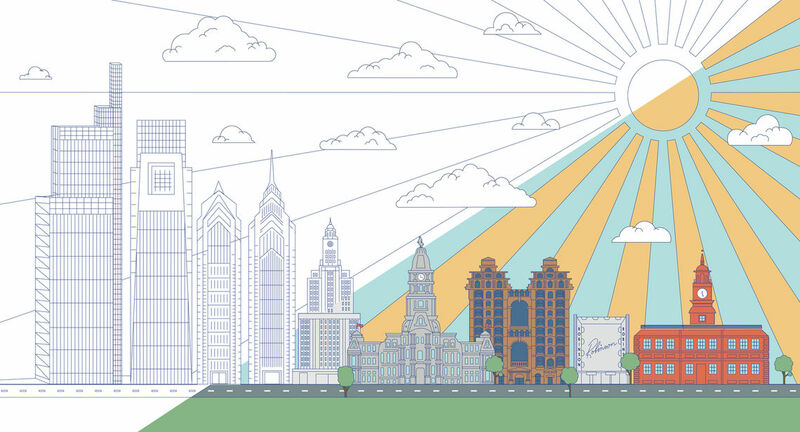 I envision that forward-thinking cities such as Philadelphia will adopt the Triple Bottom Line framework to value preservation and encourage sustainable development. JONATHAN NAPOLITANO was the runner up in the inaugural Excellence Student Article Competition. He studied under Dr. Simi Hoque at Drexel University’s Department of Civil, Architecture and Environmental Engineering.